With the remake of the movie "True Grit" garnering rave reviews and Oscar nominations, I bring you a photo from the HPD Museum archives from 1968. This photo depicts the original True Grit star, John Wayne, posing with HPD Chief of Police Herman Short. 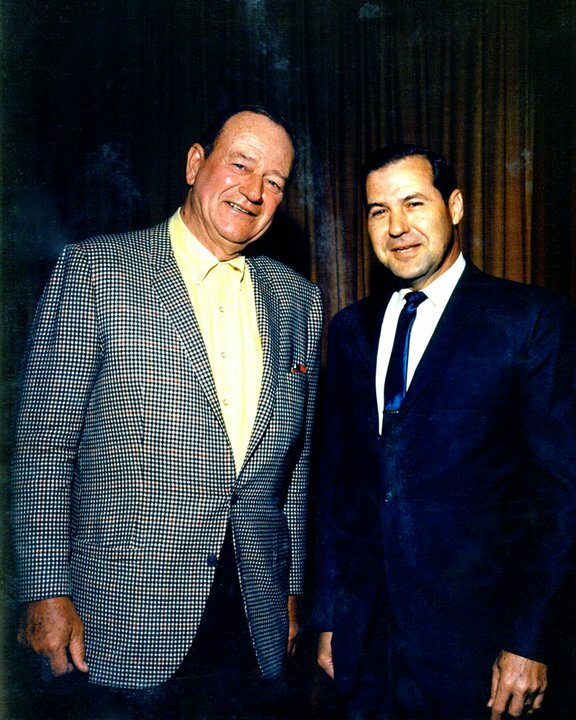 John Wayne was filming the movie “Hellfighters” in the Houston area during the time he visited with Chief Short. Chief Short, who lived in Houston, was a member of the city's Police Department for nearly 30 years and became chief in 1964. In the 10 years he served in that post, Chief Short won support for his tough law-and-order stance. A little humor for you today. IFR is a hybrid of patrol work and investigative work. The Division has 68 officers spread across the city who follow up on leads in a various array of crimes such as robberies, assaults, burglaries, and thefts. It is an exciting job that allows the uniformed officer to not only "respond to the call" but to take the information and "run" with it. IFR Officers perform a variety of investigative tasks that have traditionally been restricted to officers assigned to the Homicide, Robbery and Burglary & Theft Divisions. They take statements, show photo spreads, obtain charges, and track down wanted suspects. 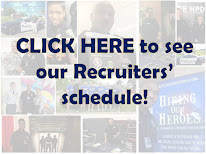 The assignment is perfect for the officer who likes to be in uniform serving the public but also likes the investigative aspect of police work. Since I've had a police officer as a significant other, I've often heard this from people outside law enforcement. Many of my friends and family misunderstand some of the stress and complications that come with loving an officer. What surprises me most is sometimes I hear this same sentiment from those who do love an officer. We all have different experiences and there are no blanket statements when it comes to loving someone who has made the oath to protect and serve. All I know is my experience and what it means to me to love a policeman. How I feel it differs from loving a file clerk, a lawyer, or a trash collector. If a trash collector went out on his truck every day poised to potentially face a life threatening situation, would his loved ones consider it just a job? His body rigid for 10 hours, hyper-alert to everyone and everything around him waiting, watching for a sign something deadly is happening. Along with this, wearing equipment that stresses his body and continues to remind him of his purpose and his potential for the power to take a life. The trash collector would have to go to every house not knowing what was really happening and having to have the mental alertness and acuity to sort through piles of human deception, horror and pain. He does his rounds, which include seeing the depth of human evil, possibly the body of a baby or a family wiped out, the pain of a mother's face who’s lost her son to death or drugs, a drunk driver wrapped around a tree, or a 13 y/o runaway with a baby face but hollow eyes prostituting herself. After he finishes carrying the weight of mediator, law enforcer, bearer of death, protector, mental health worker and devil, he returns to the station where the real fun begins. I've never heard of a trash collector's wife listening as her stone-faced husband tells the story of pulling a 4 y/o out of the mud after being run over by her father's tractor. Her mother standing wailing beside him. A trash collector's wife does don't hold his head in her lap when the numbness cracks and the sobs begin. 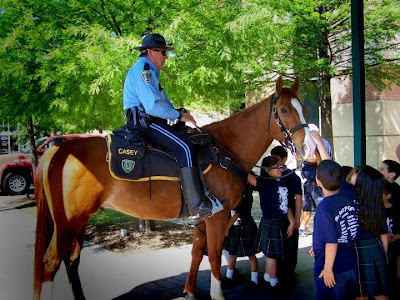 In my experience, here are a few things that make loving a police officer different. One of the biggest complaints I have is the hours. They were erratic, long and make planning things a nightmare. Even though he had a set shift (I was lucky because my husband's department did not have mandatory rotations every 2 or 3 or 6 months), that didn't mean he would be home when he wasn't on duty. 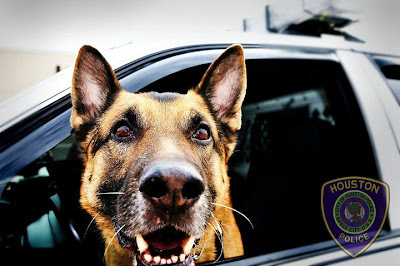 He might not be on patrol, but he would have training or most likely court. When he was home, he could be on stand-by which I felt was worse. We couldn't plan anything and we'd go into any activity with apprehension as to when he would abruptly be pulled away for his job. After we had kids, I felt like a single parent. He allowed me to make most of the day-to-day decisions because he felt he wouldn't be there to execute the plans so he didn't need to make the plans. When I needed to switch out due to frustration, often there was no one to switch out with. There wasn't the hope, which lingers when you don't have a partner, that someday it might be different. As long as he wore a badge, I would be the primary parent. This was another struggle for me especially when I continued to study communication style, command presence and police technique. In the beginning, I didn't recognize his training in those things that bugged me about how he would handle conflict in our home. It seemed every argument was a challenge to him. He would flip to an authority in his voice and in his stance. It wasn't aggressive, just commanding. In time, I realized we both had to adjust our communication style because neither of us had been taught how to talk to our significant other or how to express our needs in a healthy manner. He reverted back to the only communication training he had which was designed to control situations and people in a law enforcement situation, not one with his wife. Another hard thing to take is living in a fishbowl. To each law enforcement officer and his or her family this can look very different. My husband and I lived in a large metropolitan area and many of our neighbors did not know what he did for a living. He worked in an area away from our home and didn't have to mediate conflicts with people he had grown up with. Many officers and their families struggle with separating the personal from the professional. What we faced most often were the constant questions or requests for advice from people when they learned he was an officer. I would stand quietly by his side waiting to go mix and mingle at a party as he would explain why the officer had a right to give this friend a ticket, how a civil case was different from a criminal case or why a recent police shooting across the country was or was not justified in his opinion. I doubt a trash collector's wife has to listen to queries about the best way to get out of putting their can at the curb at the right time of morning. The biggest difference in being married to a law enforcement officer, in my opinion, is being connected to the pain that comes with the job. No human could be out in the world seeing, feeling, hearing and experiencing the amount of chaos and turmoil that exists in a police world and not be affected. This affect comes home with them. It gets reflected to those this officer loves in many different ways. It comes out as frustration, anger, impatience, distrust, and the hardest for me to handle, grief. Words cannot express the fear and sorrow that entered my heart when my strong, well trained, composed, stoic husband cried. The ache it caused in me is indescribable. I faced those tears after he witnessed the death of a child, after a violent sexual predator who he had spent hours meticulously building a case against went free on a court blunder and after losses of his brothers in blue; three to gunfire, one to a fight that ended up under a semi and one to a car wreck on his way home from shift. The ache still haunts me. Being married to a police officer is not like being married to someone who does any other occupation. Yes, it is just a job, but within this job comes a lifestyle, a way of thinking and a social atmosphere. For these reasons, and those I've described, we have been given books such as, I Love a Cop and Cops Don't Cry. These manuals, along with support groups, online forums and informal get-togethers, help us survive in our world affected by our LEO's world. As long as we love a cop, we get to enjoy the whirlwind of emotion that comes with pride when he, or any other officer, does well or shame, when someone in blue messes up. 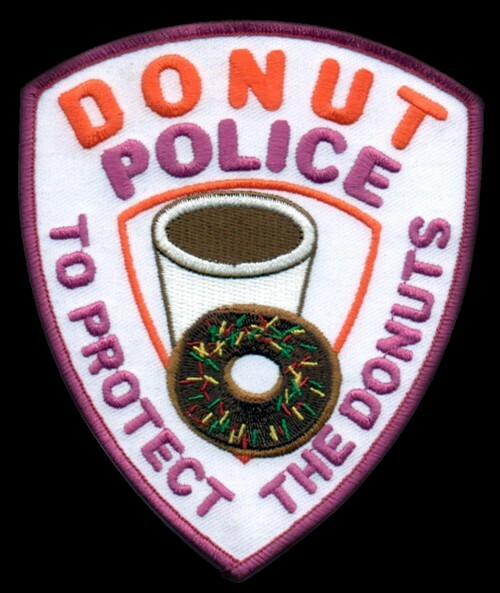 We want to defend and justify when they or just their badge is attacked. We know most of them are good, honorable men and women. Because of this, we fight for them in public and in our hearts. This is what makes it different. HPD K-9 Alpos: I recently responded to an ad for work with the FBI. "Well," says the personnel director, "you'll have to meet some strict requirements. First, you must type at least 60 words per minute." Sitting down at the typewriter, I typed out 80 words per minute (facebook experience.) "Also," says the director, "you must pass a physical and complete the obstacle course." I finished the course in record time (HPD training.)" There's one last requirement," the director continues; "you must be bilingual." With confidence, I looked up at him and said, "Meow!" He was not amused. 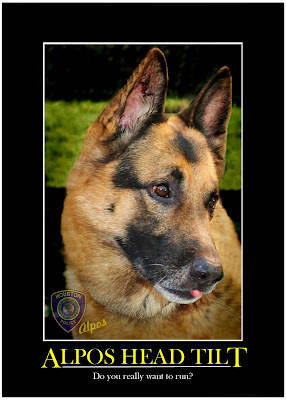 It may have not worked out for HPD K-9 "Alpos" but if you are bilingual you will receive an additional $140.00 monthly incentive pay on your paycheck. The optimist sees the donut, the pessimist the hole. Becoming a Houston police officer is not going to happen overnight. This is a process that takes time and effort, not only on our part but on your part as well. Make sure that when you do get the call, you are able to attend and please make sure you have all your documents ready to be presented. Example of what not to do: "Officer, I would like to make that appointment, but you see, I was going to go see Pirannah 3D today. Can we reschedule?" A couple of months ago, Midwest and Westside Divisions investigated a string of robberies where multiple suspects would perform “take-down” style robberies on various area banks. The robberies appeared to be increasing in frequency and the level of force used by the suspects increased as well. District officers were apprised of the crimes, suspect descriptions, and the potential dangers of a likely armed confrontation. Then the inevitable occurred, another hold-up alarm dropped at an area bank. In anticipation, all available units and supervisors converged on the location. Officer D. Zoretic, arrived, verified a true alarm, and then broadcasted a description of suspect’s. Due to the direction of the suspects travel, Westside Division was advised and numerous officers responded in order to assist. Officer D. Villarin, who was responding to the directions, observed a vehicle possibly involved, and began to follow. Officer Villarin advised dispatch of the possible suspects and vehicle description and was able to maintain a visual. As Fox (HPD Helicopter) arrived on the scene, the suspects abruptly stopped and all four suspects fled on foot into a large apartment complex. Officer Villarin, assisted by Officer J. Falcon, apprehended the first suspect shortly thereafter. With the assistance of Fox, a perimeter was established by Midwest and Westside officers. Officers then discovered an apartment unit which appeared to have sustained forced entry and additional investigation suggested that hostages may be a concern. On their own initiative, a Tactical Operations team who was monitoring the channel promptly responded along with a K-9 unit. Shortly thereafter, two hostages were freed and two more suspects were taken into custody. 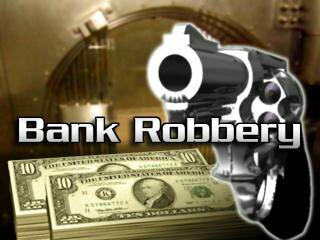 A team of bank robbery investigators responded to the scene and assisted in apprehending the forth and final suspect. Due to the multiple and complex nature of the crime scenes, Officers C. Truhan, and L. Verbitskey, responded and processed the scenes for evidence of the crime spree. As a result of these officers attention to duty, timely response, and cooperative efforts, four extremely dangerous serial robbery suspects were arrested and charged. The magnitude and variety of divisions working in unison, to bring this event to a safe and successful conclusion, is miraculous and worthy of commendation. It is with great pride that we commend these HPD employees for their efforts. This career is not for everyone, but for those who choose this career you will become part of a family that will last a lifetime. I came across this video recently and wanted to share. 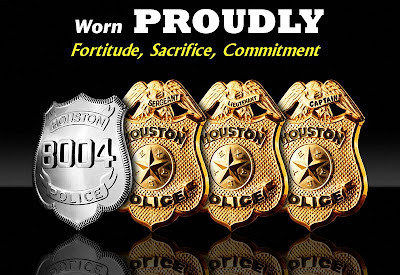 On January 1, 2011 a new law went into effect that will assist Houston police officers in completing their undergraduate law enforcement or criminal justice degrees. 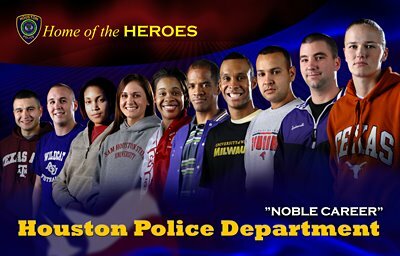 Houston police officers will now be exempt from tuition and lab fees for criminal justice and law enforcement courses. Recently, Officer C. Rodriguez while on patrol heard a General Broadcast over the police radio of a suspect involved in a robbery that occurred in the county and realized that the suspect and vehicle description matched that of an earlier robbery within the city limits. Officer Rodriguez immediately went to the general area of the latest robbery in an attempt to locate the suspect. While enroute to the location, Officer Rodriguez noticed what appeared to be the suspect’s vehicle heading in the opposite direction in which he was traveling and immediately turned around to get a better look. Officer Rodriguez managed to get close enough to the suspect’s vehicle without being detected. While the suspect was stopped at a red light, Officer Rodriguez noticed the suspect counting money and rummaging through items on his lap. Since the vehicle and suspect matched the robbery suspect’s description, Officer Rodriguez attempted to affect a traffic stop, at which time the suspect sped off at a high rate of speed. The suspect then began driving erratically by running several stop signs and making numerous u-turns in an attempt to elude Officer Rodriguez. The suspect finally lost control of his vehicle when attempting to make a turn and hit a residential mailbox, which disabled his vehicle. Officer Rodriguez attempted to conduct a felony traffic stop when the suspect pretended to be wedged between the driver’s door and the mailbox post. Thinking the suspect was trapped, Officer Rodriguez cautiously approached the suspect in an attempt to get him into custody. When Officer Rodriquez attempted to pull the suspect free, the suspect suddenly lurched at the Officer Rodriguez and threw a punch at him. Officer Rodriguez grabbed the suspect, who then broke free by wiggling out of his shirt. The suspect fled on foot with Officer Rodriguez in pursuit. Upon capturing the suspect, a struggle ensued. The suspect attempted to disarm Officer Rodriguez, managing to break free once again as Officer Rodriguez was regaining control of his weapon. Officer Rodriguez, without regard for his own safety, continued to pursue the suspect into a large field and was able to catch up to suspect alongside a bayou. After another brief struggle, Officer Rodriguez was finally able to handcuff and secure the suspect. A search of the suspect revealed that the he was in possession of cocaine. A subsequent search of the suspect’s vehicle enabled officers to recover a loaded pistol and other evidence belonging to victims that linked the suspect to at least four recent robberies in the area. 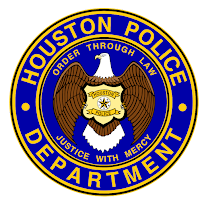 The suspect had an extensive criminal history and had an outstanding felony arrest warrant out of Harris County, as well as a suspended driver’s license. Throughout this precarious situation, Officer Rodriguez showed extreme courage even though he knew he was dealing with a violent suspect and was doing so without any immediate back-up. His diligence and attention to duty resulted in the apprehension of a dangerous felon who would undoubtedly strike again. He repeatedly risked injury to himself while endeavoring to ensure the safety of fellow officers and innocent citizens. HPD commends Officer Rodriguez for his outstanding performance and steadfast dedication to the community.